As you may have noticed, the topic of phishing has been at the forefront of the concerns within the IT security 2016 landscape. As attacks become more challenging to identify, organizations become more susceptible to breach. Ransomware infections are often instigated through phishing emails. It’s crucial to take proactive measures to help protect yourself and your organization’s security. 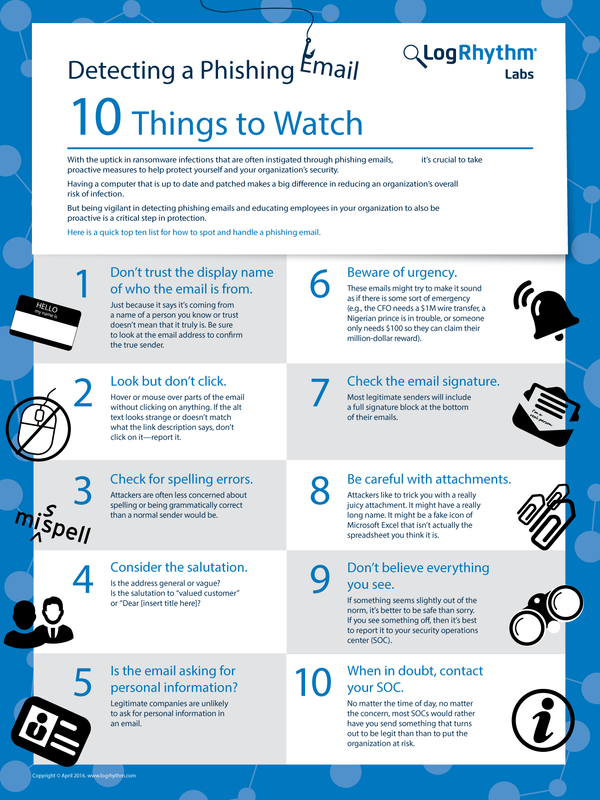 LogRhythm’s infographic displayed below, provides you with a quick top 10 list that you can use to help educate you and your team on how to effectively spot a phishing email. What is the most elaborate phishing attempt you’ve seen? Let us know, we’d love to hear from you!